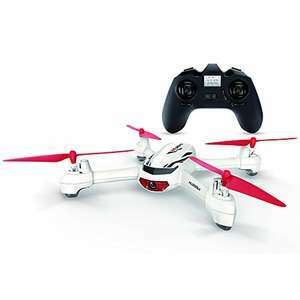 Hubsan H502E X4 Quadcopter Drone with GPS, 720p Camera for ￡54.99 Sold by Virhuck Toys EU and Fulfilled by Amazon. I have one and they are simply a good drone you can buy for portability, quality, performance and price. Ideal for xmas pressies! Good price cheaper than the other stores. Youtube has reviews on this brand quadcopters and if anyone is thinking of buying. To get the price, make sure to click the promotion message on the page and redeem voucher before adding to the cart. How long the fly time last? That includes 7 mins trying to find the propellers when they separate from the drone during flight. This is a great price for a GPS drone from a decent manufacturer. The GPS makes it a lot more stable to fly and a lot harder to lose, so great for beginners or kids. Flight time is around 8 minutes but you can get additional batteries for between £7 and £12 depending on if you are happy to source from China or not. Guys I want to buy a quadcopter/drone as a surprise for my partner, I know nothing about them and i'm looking to spend around £130. Is there one that stands out in that price range please? I don't know anyone else to ask!